As soon as iOS 7 was jailbroken, Cydia was opened up to the inevitable plethora of iPhone 5s-only tweaks. By that, we obviously mean tweaks that use the iPhone 5s’s Touch ID fingerprint sensing system, and with it being such a prominent feature it was really only a matter of time before jailbreak developers started to use it in some interesting ways. We’ve already told you about a tweak called Touchy for iPhone 5s that allows individual fingerprints to be used to launch different apps without the need to tap any icons, but as is the case with apps and tweaks on iOS, Touchy isn’t the only option. A new alternative has sprung up, and it does something a little unique. Called BioLaunch, this alternative will cost a dollar to install. It’s cheap enough, of that there is no question, and according to its description in Cydia it does something very similar to what Touchy already offers by allowing people to set an app that will be launched when Touch ID detects a particular fingerprint has been laid upon it. That, at this point, is pretty standard fare for Touch ID related iOS tweaks, but where BioLaunch does things a little differently is an additional feature that allows the automatic selection of your most used app. With the flick of a toggle inside BioLaunch’s settings, the tweak can track which apps are used the most and then make that app the one it launches upon a successful fingerprint detection. The idea is that your favorite app is always the one that gets launched, meaning you don’t need to go changing it every time you have a new app that you’re using a lot. The theory is relatively sound, though we’d have to spend some time with it to see how useful it really is. Another additional feature is one which sees a confirmation button pop up when a fingerprint is detected, rather than the app being launched instantly. This is claimed to be a good way of stopping accidental app launches, though we do wonder if having to tap a button on-screen rather negates the whole point of having apps launchable via a Touch ID interaction. Still, the theory is once again fairly sound. 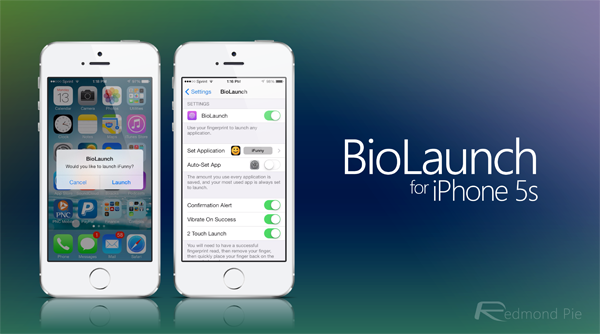 If you have a spare dollar, BioLaunch is available in Cydia now under the BigBoss repo.